I don’t have it in me yet to make this the kind of place with new content on a consistent enough basis. So for now this blog just doesn’t work that way. I’m generally too preoccupied with information “arbitrage”, shuttling links back and forth across the hive mind, to set myself the task of summarizing my understandings in a readable form. Although I am more than willing to take questions. Almost all my content is dense and resource rich. I haven’t specialized in creating content, I’ve specialized in tying content together in discrete bundles. OPEN SOURCE ALL THE THINGS! FREE ENERGY AND FREE INFORMATION FOR A FREE PEOPLE! “This video offers a solution to the Hard Problem of Consciousness. It contends that there are 2 epistemological hurdles that have historically prevented man from solving this mystery… and these epistemological hurdles are a consequence of evolution. I like where he ends up, but don’t use the same steps. I think the combination of two lectures below paint a more accurate picture. I don’t think we are EM [electromagnetism] either. Electromagnetic fields can obviously exist without self-awareness. The point of interest has to be how matter and energy are arranged to represent an information processing system that can represent itself. It’s the properties and organization of information processing itself that create the possibility of representation, and this software is, in principle, capable of operating on any “physical” platform of sufficient resolution and complexity to support the requirements of said software system. There is no world to a process that doesn’t represent one. Stage one is representing (is). Stage two is representing representing (something is). Stage three is representing representing representing (I am something). Stage four is representing representing representing representing (I am that I am / All is). 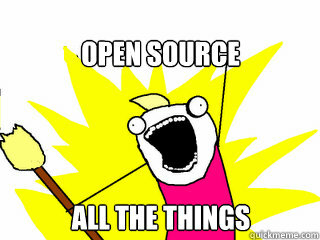 OPEN SOURCE [and crowdsource] ALL THE THINGS! FREE ENERGY AND FREE INFORMATION FOR A FREE PEOPLE! Why should one of the most popular ideas on change.gov (and rightly so) be dismissed in a sentence? Why is it still up to someone else to make the rules of how we decide to make collective decisions? Why isn’t it up to us? As soon as enough of us decide it is up to us, it actually is up to us; that’s how society works. We’re running for office (or run yourself and do the same). Write in Neil deGrasse Tyson everywhere. Let him be a Trojan horse of direct democracy. Take back your power. Start having a say in the laws that bind us. If you don’t have any power over decisions that affect your life you’re not free. Let’s become a free people again. Everyone agrees corporations, banks and Feds have too much power. Congressional approval is hovering at historic lows and increasingly authoritarian laws are getting passed alarmingly quickly. This short list of grievances from a few months ago is already outdated[iv]. The U.S. government has said that it can kill you if it calls you a terrorist; it can lock you up without giving you a chance to prove your innocence. Let’s face facts people, America is no longer a free country[v]. Can you think of any definition of a police state that the U.S. doesn’t fit? What does consent of the governed even mean with our Top Secret Government? “The top-secret world the government created in response to the terrorist attacks of Sept. 11, 2001, has become so large, so unwieldy and so secretive that no one knows how much money it costs, how many people it employs, how many programs exist within it or exactly how many agencies do the same work.” Even The Economist at the heart of establishment journalism says, “Never in the civilised world have so many been locked up for so little.” Never ending war is the status quo[vi]. To how many countries do questions like, “Is the nation fighting in too many places?” even make sense? Not to mention global warming will continue and may soon become irreversible and “every living system in the biosphere is in decline and the rate of decline is accelerating. There isn’t one peer-reviewed scientific article that’s been published in the last 20 years that contradicts that statement. Living systems are coral reefs. They’re our climatic stability, forest cover, the oceans themselves, aquifers, water, the conditions of the soil, biodiversity. They go on and on as they get more specific. But the fact is, there isn’t one living system that is stable or is improving. And those living systems provide the basis for all life. [vii]” Did I mention the eventual inevitability of an asteroid strike that we’re not prepared for. All this while technological development is accelerating exponentially and we’re capable of doing more with less than ever before in history. Even solar power is following Moore’s Law now. In 2010, 93% of all income growth in the United States went to the top 1%. It would be hard for a rising tide to lift fewer boats. You really don’t think we could figure out a healthier way to organize society if we put our minds to it? We can do this if we stop letting Big Business and Big Government stand in our way and forge our own future together, honestly and transparently. “There comes a time when silence becomes betrayal.” – Martin Luther King Jr.